Arthur Ambrose McEvoy (1878-1927) was an English artist. His early works are landscapes and interiors with figures, in a style influenced by James McNeill Whistler. Later he gained success as a portrait painter, mainly of women and often in watercolour.The son of a Scottish engineer he was born in Crudwell, Wiltshire. Encouraged by Whistler, who spotted his talent early on, McEvoy enrolled at the Slade School of Fine Art in London when he was fifteen. At the Slade he was part of the group around Augustus John and William Orpen. McEvoy had the reputation for fine technical skill in oils, learnt from study with Whistler. He later worked with Walter Sickert in Dieppe. Whilst at the Slade he was fellow pupil of Gwen John, with whom he had an unhappy affair. From 1900 he exhibited at the New English Art Club (NEAC), and became a member in 1902. In the same year he married the painter Mary Edwards (1870–1941). In 1907 he held a one-person exhibition at the Carfax Gallery. In 1911 he was a founder-member of the National Portrait Society, and in 1913 he became a member of the International Society. His works that he exhibited at the NEAC were landscapes and interiors. After about 1915 he established a reputation as a portrait painter of fashionable society beauties, often painted in watercolor in a rapid, sketchy style. 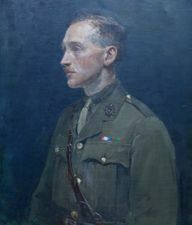 During World War I he was attached to the Royal Naval Division from 1916–18, and painted a number of distinguished sailors and soldiers, now in the Imperial War Museum and the National Maritime Museum. McEvoy visited New York and exhibited there at the Duveen Galleries in 1920. In 1924 he was made an Associate of the Royal Academy and of the Royal Society of Portrait Painters and of the Royal Watercolour Society in 1926. He also exhibited at the Grosvenor, Grafton and Leicester Galleries. McEvoy died in Pimlico, London, on 4 January 1927. In 1928 he was represented in the Royal Academy Late Members Exhibition. In 1933 he was memorialised together with Orpen and Charles Ricketts in an exhibition in Manchester.